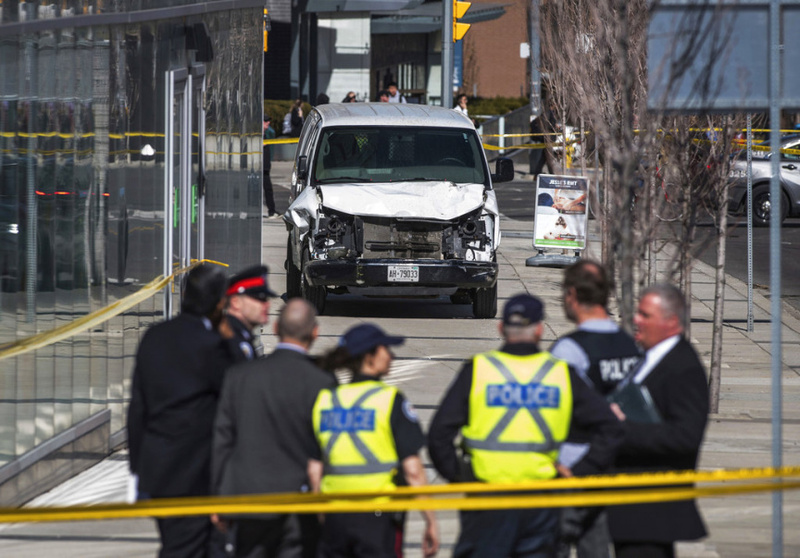 TORONTO (AP) — Police in Canada's biggest city were piecing together witness accounts and surveillance video on Tuesday to determine why a driver plowed a rented van along a crowded sidewalk, killing 10 people and injuring 15 in what many said seemed a deliberate attack. Prime Minister Justin Trudeau downplayed the possibility of terrorism, saying Tuesday that authorities see no national security element in the case. Witness Phil Zullo said that he saw police arresting the suspect and people "strewn all over the road" where the incident occurred. The incident prompted police to beef up security and close several streets around the Air Canada Centre on Monday night for the Toronto-Boston NHL playoff game. Police tweeted that similar road closures may be in effect for the Toronto Raptors NBA playoff game on Wednesday night. Associated Press writers Ben Fox in Miami, and Rob Gillies in Ocho Rios, Jamaica, contributed to this report.